Join the Oppose Belwood Wind Farm group on Tuesday, October 8th for an important meeting about legal strategy. Over the past several years many rural communities have been investigating their legal options in the fight against wind industrialization. Recently there has been a development that could be beneficial to all communities led by Barrister Julian Falconer. The case is based on the merits of a Charter Challenge of the Canadian Charter of Rights and Freedoms. Section 7 of the Canadian Charter of Rights and Freedoms states that: “Everyone has the right to life, liberty and security of the person and the right not to be deprived thereof except in accordance with the principles of fundamental justice.” The Appeal states the right to security of a person and principles of fundamental justice have been violated. Julian will be joining us in Belwood by teleconference to provide details on the case and the progress made to date. This is an opportunity to get first hand information on the status of the case as well as to discuss how we can work together to raise the necessary funds to support it. The Belwood group is organizing this meeting because they believe the claim is a viable legal option. After the presentation, their community will vote to determine financial support. Other communities at risk from wind turbines are welcome to participate as the legal action has the potential to benefit all of us in rural Ontario. The view from Brinston: aren’t they “green”? A local pilot photographed the activity from the air, and we bring you a photo of what a turbine construction site looks like from above. This is just ONE turbine and actual construction on it has not really begun. What’s interesting about Brinston is that the wind power project, which was opposed by local residents, represented by WCO member South Branch Wind Opposition Group, will be up and running next spring, just months before Ontario’s municipal election in October, 2014. By then, residents will be experiencing the brunt of what it’s like to live near 500-foot, 3-megawatt turbines. We’re sure that experience will help them make decisions as to whom to vote for on the South Dundas Council. Despite numerous well-researched presentations by local resident, many councillors just threw up their hands and said, there is nothing we can do. Or worse, they actively supported the power project, citing the wind industry claims of job creation and benefits to the community. This is the most recent municipality to declare its non-acceptance of huge wind power projects since the Premier first stated earlier this year that her government would only put wind power projects in communities that were willing. It is important to note that these 69 communities are members of the 90 or so Ontario communities that could be involved in wind power. Niagara Wind execs depart Wainfleet Council Meeting after failing to get road use agreements, or a “vibrancy fund” until Wainfleet is forced to do so when a Renewable Energy Approval is granted. 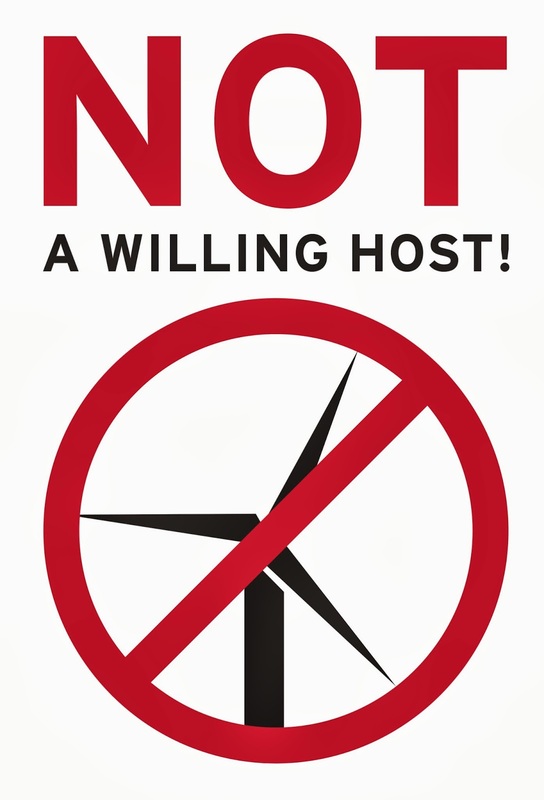 Wainfleet is Not a Willing Host to wind power. the March 31, 2013 annual report should also have appeared. In any event, the “stranded debt” which started life on April 1, 1999 at $19.4 billion has been further reduced and as of the end of March 31, 2012 stood at $12.3 billion. OEFC has generated gross revenue of $49.5 billion since its inception, April 1, 1999 to the end of March 31, 2012. Of that amount, $11.9 billion came from ratepayers under the guise of the “Debt Reduction Charge” (DRC). What this means is, the $6.1 billion reduction in stranded debt gobbled up that $49.5 billion in gross revenue and, further, each $1 billion reduction in the stranded debt required $8.1 billion in revenue. The original debt on OEFC books April 1, 1999, was $31.2 billion−it had reduced by $2.4 billion as of March 31, 2012 when it stood at $28.8 billion. That meager debt reduction required $20.6 billion of revenue per $1 billion of debt reduction. If we look at the “Residual Stranded Debt,” originally calculated as $7.8 billion, we can see from the following chart that it has reduced by $3.3 billion. In other words, in 13 years, the Residual Stranded Debt has required $14.6 billion of revenue per $1 billion of reduction. Ontario’s ratepayers were told the DRC would be around for only a few years. This report would seem to indicate, however, 13 years later, that it will take many more years before it finally disappears. To retire the remaining “Residual Stranded Debt” could require $65 billion in gross revenue to OEFC before it is finally paid off. At the current average of approximately $4 billion in annual revenue, it will take 16 years and another $16 million of DRC charges to ratepayers before that happens. acronym and retain any inherent future marketing value in its use. The opinions expressed here are those of the author and not Wind Concerns Ontario. Ontario’s electricity Residual Stranded Debt—another 16 years til paid off? Really, honestly, if all you people who live in the country would just LEAVE already and get a 400-square-foot condo in Toronto, these stories wouldn’t happen. TORONTO – Hydro One, how could you? Tony Kenny is too polite to ask but somebody has to pose the question. On Sept. 5 he contacted the power utility to complain about frequent, unexplained power outages at his small farm just outside Peterborough in the community of Bailieboro. The bigger problem being that the supply of power is not just a necessity of life for his animals, there is another reason. Kenny lives on a disability pension. He has a chronic heart condition called dilated cardiomyopathy. It means he has medical needs that can only be sustained by the provision of electricity on a regular, 24/7 basis. Kenny lives at the constant risk of cardiac arrhythmia and/or stoke. This has been compounded with late-onset adult diabetes, meaning he cannot work and Kenny’s only source of income is the Ontario Disability Support Program. This was all outlined in his written plea to Hydro One for a better supply of electricity. Two days later he had his reply. The utility wrote to tell the 51-year-old they couldn’t help. “Thank you for contacting us about power outages in your area,” the letter opened. “Unfortunately, Hydro One cannot control all interference on our system which can cause power interruptions or voltage irregularities and from time to time, short power outages will occur on the system. Therefore, we cannot guarantee a constant supply of electricity. “We strongly advise anyone that is dependent on electrically powered medical equipment to have a back-up generation source or alternative arrangements in the event of a power outage. It didn’t end there. On Sept. 10, Kenny claims without his knowledge and without notice or permission to enter his property, Hydro One workers arrived and took the transformer away. They didn’t install a new one in its place. Kenny has been in the dark ever since — literally and figuratively — and carts water by hand in the absence of power for his electric pumps. “I don’t know what to do now,” Kenny said. “I contacted my MPP’s office and Jeff Leal couldn’t help. I live on my own and worry what would happen if my health started failing and I couldn’t raise help. “I have lived here since 1995 and never had a problem with Hydro One, always paid my bills, but as soon as I complained, that was it. When the Toronto Sun approached the utility about the Kenny case, a Hydro One spokesman said they would only offer a comment if Kenny supplied a signed disclosure form via e-mail to look into his account. “Which is great, but I don’t have the power on so I have no computer — so how can I fulfil that request?” Kenny retorted. In a final twist, Kenny says there is one reminder of his dealings with Hydro One to remind him of the utility’s unintended but ironic approach to customer service. There on the pole where the old transformer used to stand is a brand new smart meter; alone, unused and ultimately totally useless. As Tony Kenny is willing to attest, much like Hydro One itself. Rural dwellers are not the only consumers who feel powerless when it comes to Hydro One. Cottagers allege they suffer discriminatory pricing at the hands of the monopoly supplier, according to Rose Mary Rosada. “If your cottage is not your primary residence … you are billed for delivery charges at approximately 2 1/2 times that of a residence where the occupants live full time, even if they are next door to you, the cottager,” she said. “On the road where our vacation property is, there are about 12 homes — four of which are full-time residents and the other eight are seasonal. “Why is it Hydro One’s business whether this is my full-time or part-time residence (my time is split 50/50 at both) … Bell Canada charges the same rate no matter how many residences you own. “The only way Hydro One will change the way they bill my vacation property is if I have my mailing address for Canada Revenue Agency, my driver’s licence, etc. changed to my vacation property address. Hydro One would not directly address the claim of discriminatory pricing other than to direct us to their statement on seasonal property pricing versus year-round home. The understanding being that seasonal means you pay more. Why do they do that? Because they can. As a monopoly, Hydro One can do whatever it likes.